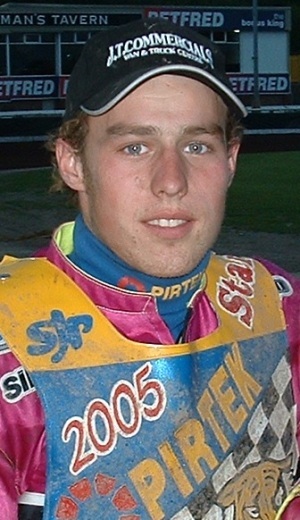 Ricky joined the Tigers in 2002 less than 12 months after first taking up speedway. Fast starting Ricky had a good solid first season, albeit with the odd mechanical problem, and was a major factor in the Tiger's fortunes. Started the 2003 season at reserve but had claimed the third heat-leader position by August. 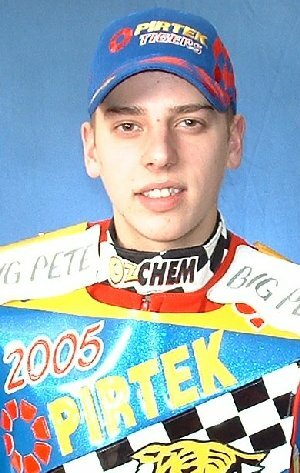 He rode for Great Britain in the U21 test match wins against Sweden scoring 4+1 at Reading, and a commendable 7 at Wolverhampton despite taking a heavy tumble while attempting to pass Peter Ljung. 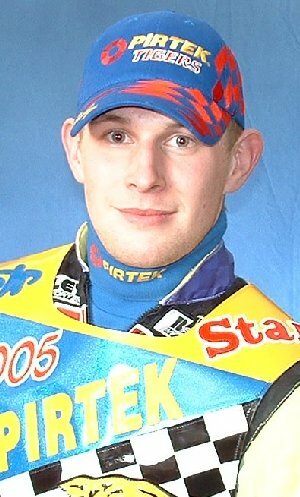 Ricky doubled up for the Peterborough Panthers in the Elite League in 2004, and this year will see him riding for both Sheffield and the Poole Pirates. As this is the last year he will be able to "double-up" Ricky is hoping that Sheffield will go for promotion to the Elite for 2006! Having trusted his engines to a new tuner over the winter Ricky struggled as a result and his away average suffered in particular. 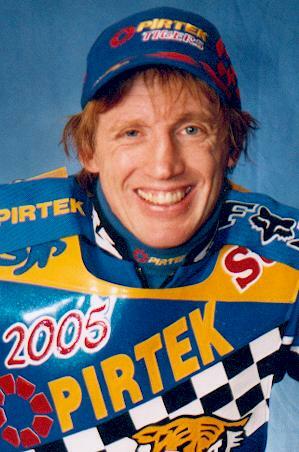 Having helped steer the Tigers to their 1999 Championship win André moved up to the Elite League with Peterborough in 2000, but became a victim of his teams poor initial form. Joining Newcastle he skippered the Diamonds to Championship success in 2001, and invariably performed well against the Tigers. When The Diamonds changed their race day to Sunday for 2003 André was looking for another team and jumped at the chance of rejoining the Tigers, signing a full contract a few weeks into the season. A bad tumble in the home match against Stoke in August saw André aggravate an old ankle injury which ultimately caused him to sit out the rest of the 2003 season. 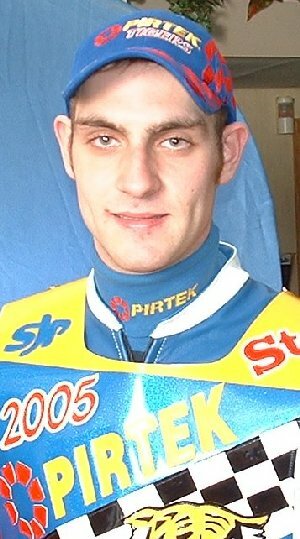 Following Sean Wilson's injury in 2004 André assumed the skippers role and his first race as captain saw him team ride Ben Wilson home for a 5-1 ahead of Berwick's Michal Makovsky. André's return to form led to him being re-called by the Poole Pirates, and on the World Championship scene he finished 3rd in the British Qualifying round at Kings Lynn with 12 points, and then 7 in the final. André won the contoversial Premier League Rider's Championship passing the unbeaten Simon Stead in the final before they both fell with André suffering injuries to both hands and wrists which brought his season to an untimely end. André has secured the services of Peter Carr to maintain his bike for the 2005 season, although his tremendous home form has not been so evident on his travels. His attempts to defend his PLRC crown were scuppered as his nemesis Alan Mogridge laid his bike down on the third turn and duped the referee into excluding the wrong man. Paul made his debut for the Prowlers in 2003 and rode in their Trophy matches in 2004 when work and grasstrack commitments allowed. His apprenticeship as a joiner now completed Paul has signed on for the Tigers and may do some Conference matches when available. Paul led the Middlesbrough Bears to a win at Scunthorpe in April scoring a 15 point maximum and claiming the track record in the process. After a torrid trip to Armadale where Paul failed to open his account and wrote-off various equipment he bounced back with his best score of the season in the narrow defeat at New Craven Park. Paul's season came to a premature conclusion following his heat 2 crash at Glasgow. He is pictured here relaxing at home just four days after surgery to repair the damage to the ligaments, tendons and muscles in his left knee. Richard joined the Prowlers from Newcastle after a spell doubling up with the Diamonds and the Gems, wasted no time in regaining his confidence and set about showing them what a mistake they had made. He was called up as cover for injured Tiger Ben Wilson towards the end of the 2003 season and his impressive performances made him the obvious choice for the Tigers second reserve berth in 2004. The May green sheet averages saw Richard move up into the team and in the difficult No.2 race jacket he improved his average slightly. Although he reverted to reserve in June as James Birkinshaw's average took a big leap, by July he was back in the body of the team and he saw the season out riding in the heat leaders No.3 race jacket as the management attempted to juggle dwindling rider resources. Richard starts the 2005 campaign as a second-string riding in the No.3 race jacket but is determined to improve his average and make the most of the financial incentives he's been offered. A string a solid performances, home and away, has lifted Richard's average and sees him challenging Ricky for the third heat-leader position. Richard's form last season led to Peter Oakes nominating him to be seeded directly into the British U21 final, in which he again finished on the rostrum in 3rd place. 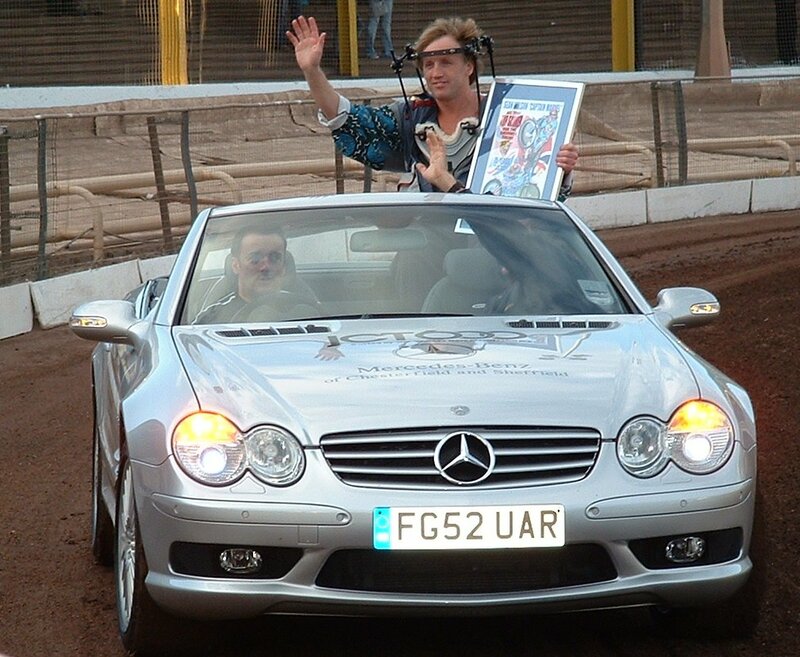 Richard followed this with an Elite League guest booking for the Poole Pirates scoring 4+1 against Swindon in May. Riding at reserve alongside fellow Tiger Ricky Ashworth his all action style was a great hit with the Dorset fans. Richard recovered after a slow start to score 10 points in the World U21 Qualifying round at Belle Vue, although his heat 20 win left him tying for the last qualifying place which agonisingly went to German Martin Smolinski who had beat him in heat 4. Richard's place in the Lonigo round was subsequently confirmed following the sad news of Rory Schlein's back injury. Richard crashed out of the home match against Newport and sustained three broken fingers forcing him to miss his World U21 round, and twelve of the Tigers fixtures. Trevor joins us as a replacement for the injured Kyle Legault and will certainly be keen to make an impression, with the hope of catching the eye of a promoter somewhere who will give him a permanent team berth. 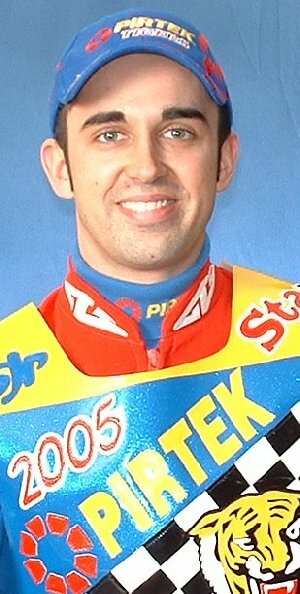 Trevor is no stranger to Owlerton as he made his UK debut riding for the Prowlers back in 2002 before joining Kings Lynn for whom he rode in the Premier League last season. Trevor also made appearances for Ipswich in the Elite League in 2004. An impressive paid 9 return was surely a major factor in the Tigers away league win at Somerset. Trevor backed that up with an equally impressive paid 11 points in the narrow home win against Glasgow which saw him claim the scalps of Shane Parker, George Stancl and the visitors top scorer (and his ex-landlord) James Birkinshaw. 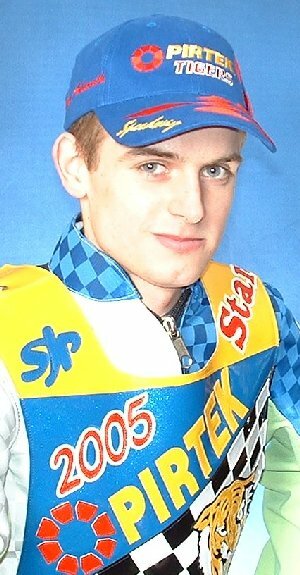 Kyle joins the Tigers for 2005 and becomes the only Canadian riding in Britain, and the first since Shawn Venables. Kyle is twice and reigning Canadian Champion and is determined to do better than his last appearance in the UK, which was the qualifying round of the World Under21 championship at Poole in May 2003. Kyle scored just 3 points on that occasion finding that the Europeans had been riding for 2 months already whereas the Canadian season had not yet started. Kyle took a few weeks to settle in but claimed his first ever Premier League win in heat two at Edinburgh. The following home match against Newcastle saw him come agonisingly close to his first paid maximum with two glorious heat wins under his belt. In his last ride against Workington at Derwent Park he took a nasty tumble into the fence after the race had finished and broke a bone in his foot. He has had surgery to repair the damage but first estimates suggest he may be sidelined until August, although Kyle is hoping to return in June! ...And June it was that Kyle made his return scoring 7 in the away fixture at Reading. For more information on Kyle surf over to [Kyle Legault's webpage]. Grandson of Roy Wilson who runs the Sheffield training track. Ben joined the Prowlers on his 15th birthday in March 2001. On his debut at Peterborough Ben went to the tapes for his first official race and sped to a dream win. Ben continues to make good progress and has already begun to perfect the 'Peter Carr' third bend dive. Ben got the nod to start the 2003 season wearing the Tigers No.7 jacket, picked up an injury to his groin in a crash at Hull and then broke both wrists when he was forced into the fence at Reading. After a slow start to the 2004 season Ben was showing some real form when he crashed in the 75th Anniversary meeting at Owlerton. Severe bruising meant he missed the Tigers first league fixture at Rye House on Easter Monday. He recovered to qualify from the British U21 final at Rye House, but on a rain soaked track at Rawicz in Poland he could only muster 6 points ending his World Championship aspirations for the year. He bounced back by passing Richard Hall (twice) in the final to win the Jeff Hall Suzuki 'Top Gun' Individual Championship in front of his home crowd. Ben makes the transition to second-string for the 2005 campaign and will need to be in top form to stay ahead of his team mates in the reserve berths. He booked his place in the British U21 final by claiming maximum points in the qualifing round at Mildenhall. Ben silenced his critics by improving his average yet again, despite spending the greater part of the season in the tricky No.2 riding position. Sean inspired the Tigers again in 2002 to a triple crown winning season. A patch of unbeatable form in July led to Sean being called up to represent his country in the World Team Cup, but a shoulder injury sustained in Poland, and aggravated at Somerset and Newport saw Sean struggling. Like a trooper he rode through the pain scoring 17 in the away win at Berwick which sealed a closely contested League Championship victory. Sean had an operation to reattach his shoulder muscle in February and missed the opening matches of the season while working to regain fitness. His return to the saddle was perhaps a little premature and resulted in some uncharacteristic low scores, and it was June before we saw Sean back to his best as his maximum at Rye House inspired to Tigers to a narrow last gasp win. Sean finished the season by winning both the Premier League Rider's Championship and the Northern Rider's Final in emphatic style and carried this form into the 2004 season. Sean had an after meeting spin following the Young Shield match against Reading at the end of September 2004 and it was great to see that unmistakeable style was still there. The long winter of fitness training has paid off and it's great to see Sean back in the saddle. There were anxious faces amongst the crowd at New Craven Park when he tumbled after colliding with Joel Parsons but Sean was able to take his place in the rerun to everyones relief. Sean dislocated his shoulder in the KO Cup match against the I.O.W. in May and is currently out of the saddle. An MRI scan has shown a fracture to the humerus and while this means Sean has to wait for it to heal it does thankfully rule out the need for surgery.